Soldiers drill interminably so they can take their rifles apart without thinking. Nishioka suggests that others of us might install default patterns to create peace and bring justice. 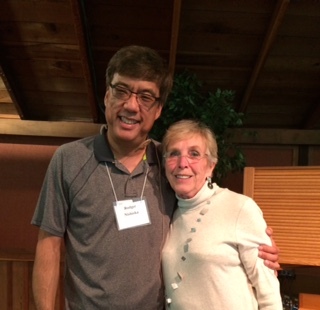 An associate professor at Columbia Theological Seminary in Decatur, Georgia, Nishioka was speaking at a church retreat, to a Christian audience. But the message is universal. “All three major Abrahamic religions,” he points out, “Judaism, Islam and Christianity, have a core belief in peace and justice.” Add the followers of decidedly peace-loving Buddha, and one would think there should be a little less war and injustice on the planet. Nishioka maintains that one person can make a difference. He tells the story of a seven-year-old girl whose father had been taken from their California farm by the F.B.I. one night in 1942, and who was waiting with a crowd of other Japanese Americans for buses that would take them to an internment camp. Her mother, in the rush to pack what the family might need, had forgotten to bring anything to eat or drink. The girl wandered off looking for something for her hungry little brother, and found a lady handing out sandwiches and juice. “We are Christian Friends (Quakers),” she explained, “and we think what is happening to you is wrong.” The girl lived through three years in the camp, where her father soon joyfully joined them, and through hard years and several moves after the war ended. She managed to enter college, where she met and fell in love with a young Japanese-American man. They married, and raised four sons who all finished college and/or graduate school, one of whom is now a professor at Columbia Theological Seminary. On the top of his list of people he’d like to meet in heaven, Nishioka says, is the lady who gave his mother sandwiches and juice. But back to patterns. Quakers practice patterns of quiet and tranquility, reinforcing their persistent efforts to right injustice. Yogis practice meditation. Buddhists chant. Practitioners of almost all religions repetitively recite creeds as a way of establishing patterns of belief and action. In California we have earthquake drills designed to instill a default pattern of Drop, Cover and Hold on. School children, sadly, are drilled to take cover in the event of an assault. If your default pattern is ingrained enough, you might even be able to grab your cellphone and passport on the way out the door when the house catches fire. What if large numbers of us altered our driving pattern just to let that jerk in the next lane break into the line ahead? Road rage deaths would nose dive. Or we could default to smiling, as Jaden, the incredibly precious six-year-old Georgia orphan is trying to make us do. Or we could default to justice: trying to create better lives for those less fortunate, those without power, those who need sandwiches and juice. It is possible, Rodger Nishioka suggests, to change the world, one person, one pattern at a time.